Stories vs screens: What's the secret to raising a book-loving baby? And should you care? Chrissie Russell looks at the impact of reading at home. FROM THE MOMENT they leave the womb there’s a wealth of entertainment competing for your baby’s attention. Screens, soundtracks and stimulating toys… but what about good old-fashioned stories? 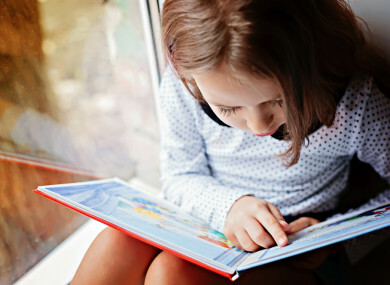 New studies are coming out all the time to champion the benefits of instilling an early love of reading in your child. The research shows that engaging with books is linked to better vocabulary, conversation skills, more logical thinking, better empathy and creativity. You might have thought there was no point in settling down for story-time with a newborn who can’t lift his own head, but research suggests you’d be wrong. “Babies are never too little to look, a very wise woman called Dorothy Butler said – and she’s right, it’s never too early to start,” says Sarah Webb, award-winning children’s writer and children’s programmer at the International Literature Festival Dublin. The more reading that goes on early in life, the greater the benefits later. A study this year in the States, which measured brain activity and attention levels in babies, found that reading infants books with named characters and labels helped them learn about the world around them. Babies were able to distinguish between different characters and had enhanced attention. Early reading has also been linked to ‘emergent literacy’ in children, meaning that from a young age they’re picking up skills they’ll need later on like recognising letters and left to right reading. But with so many other, often louder, brighter, shinier things trying to grab your child’s eye, how can you encourage them to pick up a book? When children reach the toddler stage, Aoife recommends having accessible, appealing books on a low shelf that they can reach themselves. It’s important to help children feel involved in the book selection process. Make going to a local bookshop or library a regular family activity and check out the Children’s Books Ireland book clinic, touring the country this year (see childrensbooksireland.ie for details). “At a book clinic children meet the Book Doctor, consult on their interests and walk away with a free prescription for their next read,” explains Aoife. The average time Irish parents spend reading to their children is 14 minutes a day, with a recent Growing Up in Ireland study, supported by the Arts Council and ESRI, revealing that over half of three-year-olds are read to regularly. To up the amount of reading time (something many parents say they want to do), it’s important to make it part of your regular routine. Interestingly how and who does the reading also seems to matter. A study last month revealed that two-year-olds whose dad did the bedtime story, rather than mum, had better language development by age four. The scientists behind the study weren’t able to reveal the why behind these findings but one hypothesis is that dads might provide greater ‘back and forth’, active engagement in story-telling, relating the tale to real life. Some of the best stories for kids are those that are easily relatable for them – Peepo by Janet and Allan Ahlberg, a charming day-in-the-life of a baby tale, or any of Judith Murphy’s Large family stories whose scenarios are instantly familiar to parents and tots alike. But others can cleverly tackle complex issues like a fear of the dark (Can’t You Sleep, Little Bear? By Martin Waddell) and the anxiety of separation (A Bit Lost by Chris Haughton). Proving that there’s no concept that can’t be rendered simple enough for a child’s understanding is Chris Ferrie’s ‘Baby Universe’ series which includes titles like ‘General Relativity for Babies’ and ‘Newtonian Physics for Babies’. Ferrie, a physicist and mathematician from Sydney, felt there was a gap in the market for books that reflected the technological world around us and promoted an early interest in science. The titles might make you smile, but studies have shown that children as young as two months can comprehend that objects unsupported will fall and are ‘surprised’ at magic defying laws of gravity, so don’t feel quantum physics is ruled out of the bedtime story schedule just because your tot hasn’t mastered walking. But of course the best thing about shared reading isn’t the pursuit of creating a tiny genius, it’s because it’s fun for both of you. “Children who are read to, associate books with fun, with love and with happy times, not with school and learning and having to sit still and be good,” says Sarah. Fancy winning passes for a fun-filled day of kids’ theatre at Dublin’s Smock Alley? Enter here – and don’t forget to like TheJournal.ie’s Family Magazine on Facebook and Twitter! Email “Stories vs screens: What's the secret to raising a book-loving baby?”. Feedback on “Stories vs screens: What's the secret to raising a book-loving baby?”.